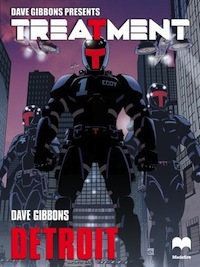 This latest instalment of Dave Gibbons’ Treatment Detroit is the first to written and drawn by the man himself and is a real adrenaline rush of action and excitement! With bullets flying and blood splattering throughout Gibbons’ dystopian reality TV franchise blurs the lines between comic and movie as the action is unrelenting and the bodies pile high from screen to screen. Why Treatment works so well in this format is its reliance on action instead of dialogue. Don’t worry, there’s still story development there (in this episode the story of agent Skully who is dealing with a terminal illness, opting to go out in a blaze of glory rather in a hospital bed), but it’s not the main focus, letting the action lead the narrative which makes for a much more exciting read. Gibbons’ expert hand balances the action and emotional beats to perfection and makes this is one of our favourite Madefire offerings to date. If we were being ultra picky we’d say its not quite the ‘absolute best’ because it lacks the intangible ‘X factor’ that books like Treatment Tokyo exhibit, with its exceptional use of smart transitions and clever use of the landscape page. This is a much more orthodox ‘comic’ and is the result of Detroit not being specifically made for Madefire – it originally appeared in print in Dark Horse presents – but that doesn’t stop it from being a fantastic read with some superb uses of the Madefire motion books engine! If anything it should be a massive positive for the company as it shows how they can transfer static pages into dynamic action so smoothly which bodes very well for the future launch of IDW and Boom Studios books that were announced at SDCC last month, and so should help usher in a new era of action packed, mainstream motion books.